about thirty years of age, nearly six feet high, tolerably stout frame, though not fleshy. His clothing cannot be described, as he took with him a variety of clothing. One of his middle fingers has been cut off just above the nail, but not recollected from which hand. It is supposed his wife a free woman is with him. She left Cumberland two weeks before Sam, for the purpose, she said, of visiting her mother, who lives near Bedford, Pa. His wife is a small woman, about 30 years of age, much darker than Sam, and very much pock marked. I will give the above reward if he is taken & secured in any Jail that I get him or will pay any reasonable charges in addition to the reward if placed in the Jail of this county. May 13, 1836 AND'W BRUCE. 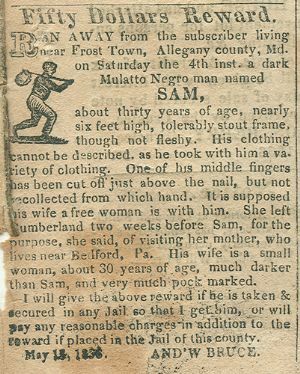 This runaway slave notice for "Sam" appeared in the Maryland Advocate, Cumberland, Maryland, Tuesday, June 4, 1833. This particular runaway slave notice appeared on the front page of the Maryland Advocate. From 1840 to 1860, the free black population of Allegany County rose from 215 to 467, while the slave population dropped from 812 to 666. The advertisement itself appears to read 1836, but it was printed in an 1833 newspaper, so presumably it was a typographical error. From the collection of Albert and Angela Feldstein.